Glasgow is jam packed with things to do, so it can often be tricky deciding what to do. We've pulled together a small list of suggestions of some fun things to get up to in the city. Kelvingrove Art Gallery and Museum - Scotland’s most visited free attraction, with 22 impressive themed galleries, this is one not to miss. Buchanan Street - a shopper’s heaven, Buchanan Street is home to the likes of House of Fraser, Nike Store, All Saints, Apple Store and so much more. Pollok Country Park - Glasgow’s largest park, it is popular with families and runners alike. The park is even home to highland cows! Merchant Square - located in Merchant City, Merchant Square houses a range of independent, stylish bars and restaurants all under one roof. It has an indoor courtyard and events are often run within the Square. University of Glasgow - take a tour of the university campus and step back in time to discover the incredible architecture of the University of Glasgow. Some say it feels like Hogwarts! What are your favourite things to do in Glasgow? The necropolis is a hidden gem - an amazing graveyard on the hill behind the cathedral. Sixty Steps on Queen Margaret Drive which is a massive retaining wall of steps that were created by Glasgow architect, Alexander ‘Greek’ Thomson in the early 1870’s. Baird in the Botanics at the Glasgow Botanic Gardens bringing Shakespeare to life in our very own city. Cathkin Braes for great walking and mountain bike treks, overlooking the city. Mansfield Park Farmer’s Market where you can find some of Scotland’s best produce such as venison, shell fish and cheeses. Glasgow’s Necropolis where you can view graves of the famous, inspirational and military as well as great views of the city. I love the Transport Museum on the Clyde. It's a really interesting visit. The food in the restaurant there is good too. Second the Necropolis! Although for somewhere quieter, the Southern Necropolis is interesting too. The People's Palace is one of my favourite museums, lots of local history. Take a tour of the City Chambers, it's free and tours take place weekdays at 10.30am and 2.30pm, there is no need to book just arrive at the reception. Tours last approx 40 mins and take in the working area, opulent banqueting hall, marble staircase and portrait gallery. There is even the opportunity to sit in the Lord Provost's chair, an ideal photo! Take a tour of Glasgow Central Station, this is the best tour I've done in the city and I've been on alot! Catch some live music, Glasgow is a Unesco city of music after all! Nice n Sleazy and King Tuts are good places to catch up and coming bands, there are plenty of bars with free music nights and some talented buskers too. Visit The Govan Stones which are housed in Govan Old Church and are free to visit. A stunning collection of early medieval stones carved in the 9th - 11th centuries to commemorate the rulers of the Kingdom of Strathclyde. The collection includes carved crosses and hogback stones of significant historical importance. Another place I love is the Sharmanka Kinetic Theatre. 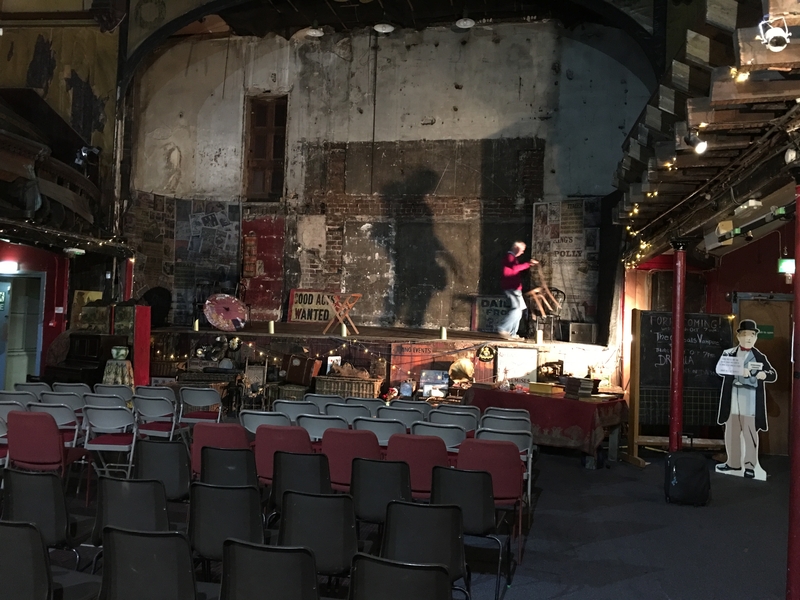 One of Glasgow's hidden gems and certainly one of it's most unique attractions, with performances involving carved figures and pieces of old scrap choreographed to music and light, telling tales of the struggles of the human spirit. It may all sound a little weird, however I prefer unmissable and magical. The works of Eduard Bersudsky are mesmerising to watch and all I can say is you have to see the show for yourself as words will never fully explain it! I have many more suggestions on my blog so do pop over if you need more ideas! Totally agree @ScotlandAdventures - the Sharmanka Kinetic Theatre is one of the best shows I've seen in the country let alone Glasgow. Completely unique and I don't think anyone who sees it wouldn't love it! The street art in Glasgow is also amazing and growing all the time - definitely unique and stumbling across a piece of art when turning a corner is one of my favourite things about the city. Also echo those saying anyone visiting the city should go to the Necropolis - fascinating and full of history. I'd also say if it's a sunny day definitely visit The Lighthouse - great exhibitions, good insight into Charles Rennie Mackintosh and the view over the city from the top of the tower is just fab! I tried the City Sightseeing Hop-On Hop-Off Bus and it was indeed very useful for getting to see a lot in 1 or 2 days. It departs from George Square in the city centre. I agree @ScotlandAdventures, the City Chambers is well worth a visit. 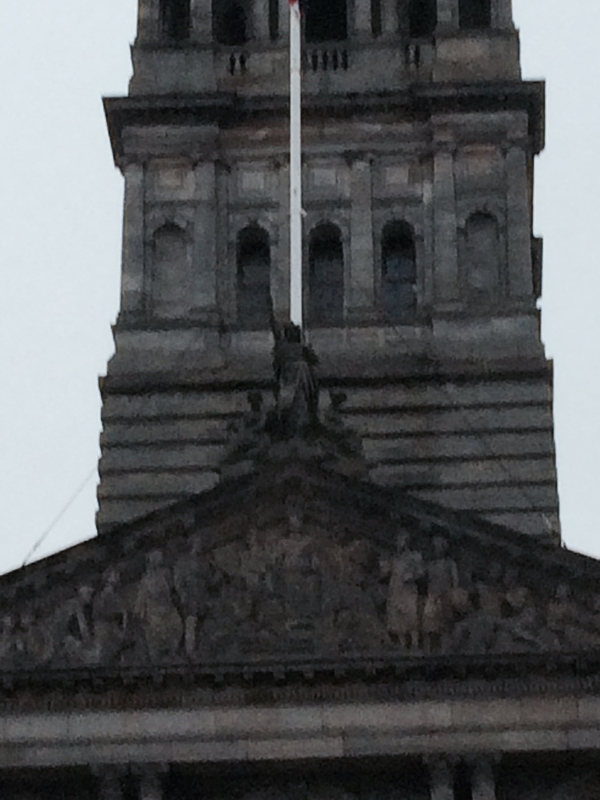 It is home to the largest marble staircase in all of Western Europe, and outside perched right on the top, is Glasgow's very own Statue of Liberty.....as seen below in the photo. Loads of hidden gems off the beaten track in the southside. Alexander 'Greek' Thomson's Holmwood House is a revelation, and an eye-opener as his work can be seen all over the city - definitely worth the quick train ride to Cathcart. Keeping an eye out for open days is a great way to see places not normally open to the public. The main event of Glasgow Doors Open is from September 12th - 18th this year. I'd highly recommend the Clydeport its a spectacular building! And what's about Glasgow Tower? I was there in this June. Go for a walk along the forth and clyde canal. There is a lovely circular walk which does the canal and the river Kelvin. Get down to the Homeless World Cup in George Square all this week - no tickets required and the atmosphere is amazing! Cheapest tip - Look up. As you wander around Glasgow, particularly Merchant City area, look up and you will see fantastic architecture around the buildings. You'll find things you never imagined !!!! The city centre murals are amazing @quine! My favourite is 'The Worlds Most Economical Taxi', it can be found at the far end of Argyle Street at the bottom of Mitchell Street. Here is the link to a downloadable map that locates all the murals. A great way to explore Glasgow! The 'People's Palace' is a must see for the visitors of Glasgow. Its on the route for the Hop on, Hop Off bus so easily accessible and beside it is the iconic Glasgow green. A few doors down from the Kenetic theatre is the Britannia Panopticon Music Theatre where Stan Laurel debuted in 1906. It's a. It run down but is now a charity raising funds to renovate. Aw it's so atmospheric. You can go in for a look around and they still put on shows at night. A wee hidden gem. I can't wait to see it brought back to life.